TORONTO, Oct. 24, 2016 /CNW/ - Galane Gold Ltd. ("Galane Gold" or the "Company") (TSX-V: GG) is pleased to announce that prospective drives in its Tau underground mine have led to the discovery of the potential extension of the Tau ore body at depth. As part of our recent review of historical exploration data anomalous mineral intersections were observed as they were structurally displaced from the main Tau ore body and sub-outcropping beyond the interpreted Western dyke limit of the Tau ore body. These intersections have not been incorporated into the existing resource model found in the Company's technical report filed on SEDAR on August 25, 2011. A prospect drive was mined at the 820RL level (170 metres below surface) to investigate the anomalous mineral intersection, and a mineralised zone ("C Reef") was intersected. Since the first intersection of the C Reef a total 265 metres of on reef development has been completed on three consecutive levels to determine the strike extent of the C Reef. At 820RL the strike extent was found to be 60 metres; at 800RL the strike extent increased significantly to 135 metres; at 780RL we are currently mining along strike and a total of 70 metres of strike has been exposed. On the 820 and 800 levels the C Reef widths varied along strike from a minimum of approximately 2 metres up to a maximum of 7 metres; from the development channel sampling the intersected grade on the 820 level was 4.78 grams per tonne ("g/t") and on the 800RL level was 2.51g/t. At 780RL the intersected grade is 3.66g/t for the 70 metres of exposed strike length. Further to this, at 780RL the C Reef has also widened significantly to a width of approximately 15 metres. To date a total of 19,380 tonnes of ore has been extracted from the C Reef horizon at an average mined grade of 3.44g/t. The ore mineralization characteristics of the C Reef are similar to those of the main Tau ore body; being a "disseminated style? of mineralization in well bedded, silicified quartz rich parts of the graphitic iron formation. Further to this the metallurgical test work conduced at the Mupane metallurgical laboratory has indicated similar recoveries to the main Tau ore body. An exploration program is being planned to start in 2017 to investigate if there is a down dip and the possible extent of the C Reef strike beyond the current mined area within the active underground working areas. There has yet to be sufficient exploration on the C Reef to extrapolate that the C Reef extends beyond the current mined area. Galane Gold CEO, Nick Brodie commented: "This could prove to be a significant discovery and of potential importance for the long term future of Mupane once more studies and economic analysis can occur and be reported on. We had planned to start looking for the potential extension of Tau at depth in 2017 and so this was a positive surprise to intersect the potential extension so early and therefore be in a position to incorporate it into our current mining plan. 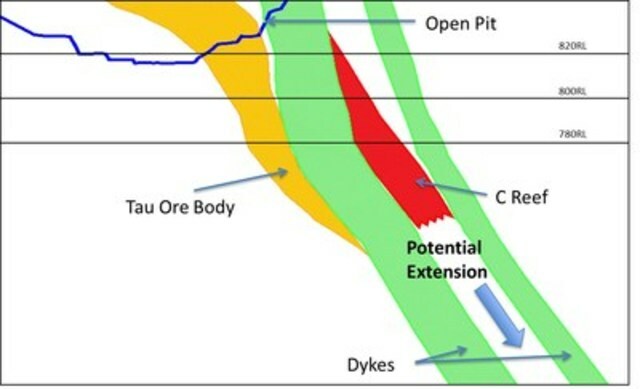 If through further exploration and analysis we confirm that this is the extension of the Tau ore body at depth it will be a further vindication of management's decision over two years ago to commence the underground operation." Galane Gold is an un-hedged gold producer and explorer with mining operations and exploration tenements in Botswana and South Africa. Galane Gold is a public company and its shares are quoted on the TSX Venture Exchange and the Botswana Stock Exchange under the symbol "GG". Galane Gold's management team is comprised of senior mining professionals with extensive experience in managing mining and processing operations and large-scale exploration programmes. Galane Gold is committed to operating at world-class standards and is focused on the safety of its employees, respecting the environment, and contributing to the communities in which it operates. Additional factors that could cause actual results, performance or achievements to differ materially include, but are not limited to: the Company's dependence on two mineral projects; gold price volatility; risks associated with the conduct of the Company's mining activities in Botswana and South Africa; regulatory, consent or permitting delays; risks relating to the Company's exploration, development and mining activities being situated in Botswana and South Africa; risks relating to reliance on the Company's management team and outside contractors; risks regarding mineral resources and reserves; the Company's inability to obtain insurance to cover all risks, on a commercially reasonable basis or at all; currency fluctuations; risks regarding the failure to generate sufficient cash flow from operations; risks relating to project financing and equity issuances; risks arising from the Company's fair value estimates with respect to the carrying amount of mineral interests; mining tax regimes; risks arising from holding derivative instruments; the Company's need to replace reserves depleted by production; risks and unknowns inherent in all mining projects, including the inaccuracy of reserves and resources, metallurgical recoveries and capital and operating costs of such projects; contests over title to properties, particularly title to undeveloped properties; laws and regulations governing the environment, health and safety; operating or technical difficulties in connection with mining or development activities; lack of infrastructure; employee relations, labour unrest or unavailability; health risks in Africa; the Company's interactions with surrounding communities and artisanal miners; the Company's ability to successfully integrate acquired assets; risks related to restarting production; the speculative nature of exploration and development, including the risks of diminishing quantities or grades of reserves; development of the Company's exploration properties into commercially viable mines; stock market volatility; conflicts of interest among certain directors and officers; lack of liquidity for shareholders of the Company; risks related to the market perception of junior gold companies; and litigation risk.Management provides forward-looking statements because it believes they provide useful information to investors when considering their investment objectives and cautions investors not to place undue reliance on forward-looking information. Consequently, all of the forward-looking statements made in this press release are qualified by these cautionary statements and other cautionary statements or factors contained herein, and there can be no assurance that the actual results or developments will be realized or, even if substantially realized, that they will have the expected consequences to, or effects on, the Company. These forward-looking statements are made as of the date of this press release and the Company assumes no obligation to update or revise them to reflect subsequent information, events or circumstances or otherwise, except as required by law. Information of a technical and scientific nature that forms the basis of the disclosure in the press release has been approved by Charles Byron Pr. Sci. Nat., MAusIMM., MGSSA and Chief Geologist for Galane Gold, and a "qualified person" as defined by National Instrument 43-101.